Vancouver, BC June 15, 2011 – Jay Peachy, local artist and social activist, has been appointed Art Director for The Canadian Flowers For Food Society’s “Bouquet of Hope Art Exhibit – 2011”. 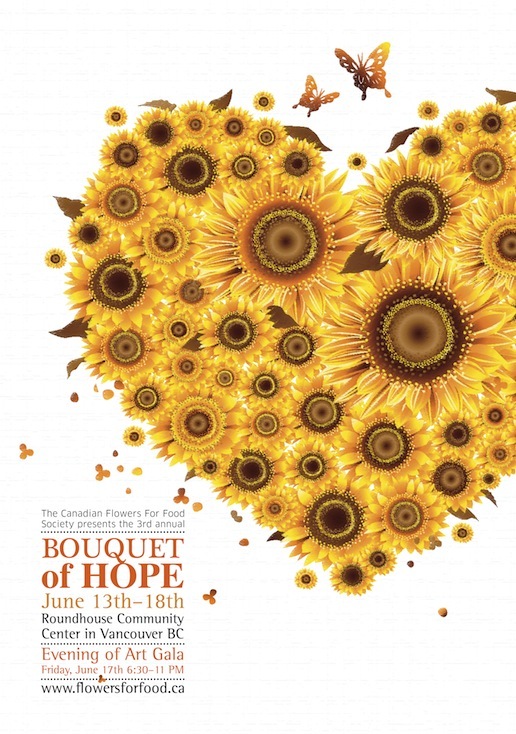 The Canadian Flowers For Food Society will display artwork from local students and artists from June 13 to June 17 at the Roundhouse Community Centre in Vancouver. On Friday, June 17, the artwork from over 30 artists including the world renown James Picard will be exhibited at the Evening of Art Gala, benefiting homeless people and marginalized groups. Through the expression of art, The Canadian Flowers For Food Society hopes more people in Vancouver will recognize the hardships of marginalized people, such as the homeless and the recovering addicts. The great cause behind the exhibit and the gala prompted Jay Peachy to collaborate with The Canadian Flowers For Food Society (http://flowersforfood.com/). “Their cause strongly resonates with my vision as an artist and an activist, and that’s why I choose to work with them and contribute my time and energy,” said Jay Peachy. Jay Peachy is an arts-based advocate for mental health. He has recently been featured in BC Local News and Kickasscanadians.ca.